Deion "Debo" Jones (born November 4, 1994) is an American football linebacker for the Atlanta Falcons of the National Football League (NFL). He played college football at Louisiana State University (LSU). Jones attended Jesuit High School in New Orleans, Louisiana. As a senior he had 179 tackles, eight sacks and three interceptions. He was rated by Rivals.com as a three-star recruit. Jones originally committed to the University of Nebraska to play college football but changed to Louisiana State University. Jones was a backup his first three years at LSU, appearing in 39 games with one start. As a senior in 2015, he became a starter for the first time. He was a finalist for the Butkus Award. In early March 2016 Jones was predicted to be second round pick in the 2016 NFL Draft. At LSU's pro day Jones had a good day, improving his results in physical drills from the NFL Scouting Combine which had taken place a few weeks earlier. All values from NFL Combine and LSU pro day. On April 29, 2016, Jones was selected with the 21st pick in the second round (52nd pick overall) in the 2016 NFL draft by the Atlanta Falcons. In Week 3 of his rookie season, Jones made his first career interception, picking off a pass from New Orleans' Drew Brees and returning the ball 90 yards for a touchdown. ↑ Reuter, Chad (Mar 11, 2016). "Four-round mock 4.0: Cowboys land Joey Bosa, Derrick Henry". NFL.com. Retrieved Mar 16, 2016. 1 2 Brandt, Gil (Mar 15, 2016). "Deion Jones has 'off the charts' workout at LSU's pro day". NFL.com. Retrieved Mar 16, 2016. ↑ "Falcons select Deion Jones in the second round". www.ajc.com. 2015-10-24. Retrieved 2016-04-30. ↑ McClure, Vaughn. 'Dream come true' for New Orleans native Deion Jones in Superdome debut. ESPN.com. 27 September 2016. Retrieved 27 September 2016. 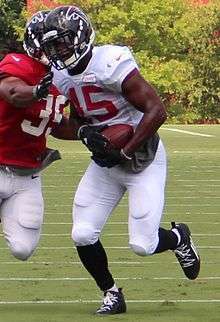 Wikimedia Commons has media related to Deion Jones.